The open area lower-right is now the Sanders Road area. 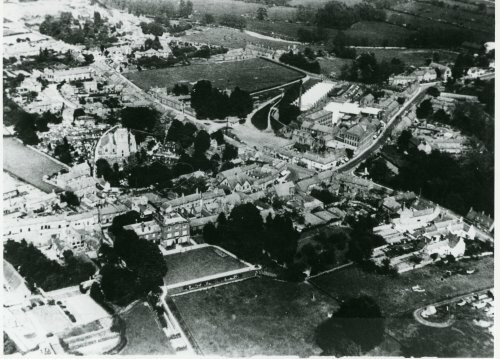 The Stafford Orchard can be seen upper-centre and just below it The Dower House is hidden by trees. Just to the left of the trees, cottages can be seen that once fronted onto Station Road. Most of these have since been demolished. The White Horse pub can be seen in the centre-right just below the mill, and cottages extend to the left of the building. These have also been lost.